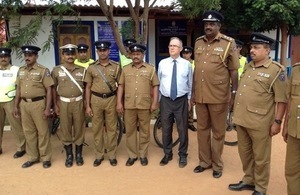 During his visit to the North this week, British High Commissioner to Sri Lanka H E John Rankin visited the Puthukkudiyiruppu Police Station to talk about the community policing programme, funded by the British High Commission, Colombo, which has made a difference to community-police relations in the area. The community policing programme, implemented in collaboration with The Asia Foundation, focuses on building relations between local police personnel and the communities in which they serve. The programme, which has run since 2012, works with 142 police stations across all 9 provinces, covering a third of police stations across the country. Among its several objectives, the programme implements a range of community policing practices such as community police forums, bicycle patrols, complaint mechanisms and community awareness programmes aimed at strengthening community-police relations that contribute to increased confidence in the police. This programme is also aimed at increasing the numbers of both Tamil-speaking police personnel in primarily Tamil-language areas and women police constables in all areas in order to ensure greater sensitivity towards minority communities.